If you travel a lot, this post is for you. Especially if you have a habit of taking a couple of suits, a tux or some maxi dresses with you. You have no time to think about this. All your thoughts are about your luggage. Will you find it quickly when you finally arrive? Will it be undamaged? And what about the suits? They must have already become wrinkled, and it’s going to take you a lot of time to make them neat. 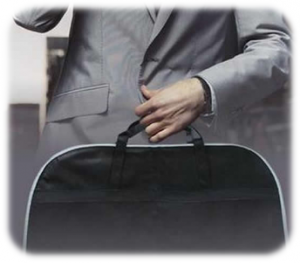 A garment bag is not a panacea, but it could help you to relax and to avoid such needless worries. A garment bag is a type of luggage bag. It is used for transporting suits, tuxes, shirts, dresses, and maxi skirts.If your clothes and essentials are not very huge, a carry-on backpack is welcomed. Actually, there is no need for it if most of your clothes do not take too much space and can be packed in a bag without excessive folding. However, if that is not so, a garment bag might be very useful for you. 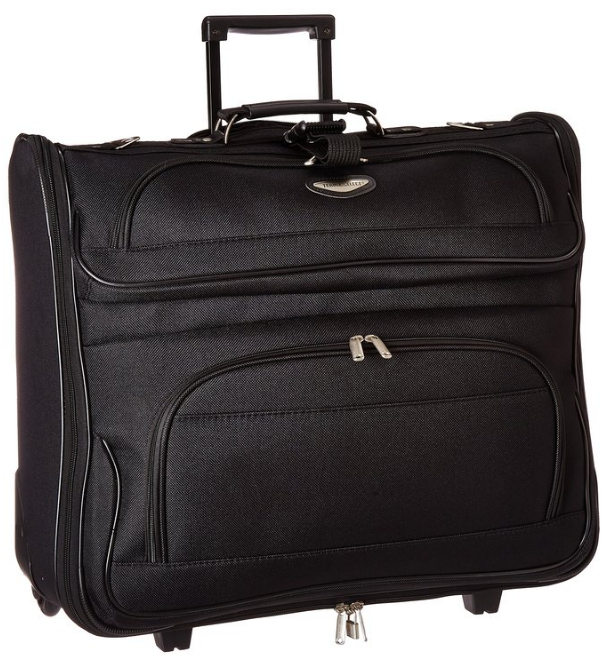 Carry-on garment bags are used for transporting a modest amount of clothes. They are not too bulky. You could carry such a bag in hands or over the shoulder. Many of these bags come with an adjustable shoulder strap, by the way. 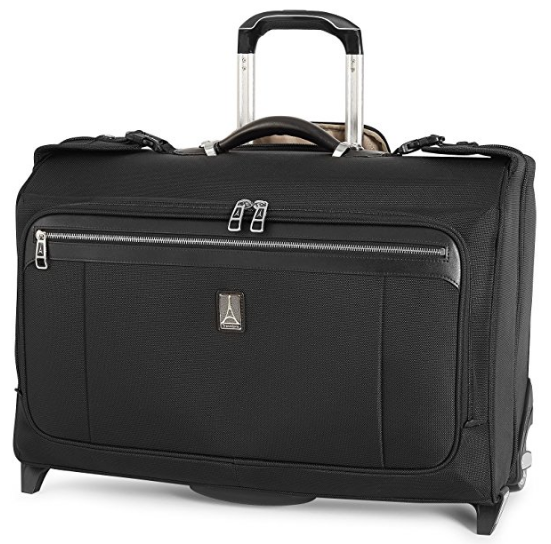 Modern carry-on garment bags have an innovative design, which allows you to keep your suits neatly folded. Just pack your clothes with a hanger and unpack them after the flight is over. Their looks will be the same. Rolling garment bags are larger than carry-on bags. Rolling bags are more spacious. You can put there much more things you might need on a trip. Surely, this bag is much heavier. There is no need to carry it and to get a back pain. The wheels of rolling bags are sturdy, and the innovative construction of the bag strengthens the bottom. It is comfortable to roll, and attaching one more bag to such a garment bag is also a possibility. A few tips concerning garment bags. Choose a garment bag made from a durable material. For example, 600D or 1200D polyester is OK. The bag should protect your clothes not just from wrinkles, but from dust and drops, too. Clear pockets inside the bag will make a pleasant bonus for best organization of your small clothes and essentials. Wally Bags offers modern travel garment bags. These bags are very popular thanks to WallyLock’s hanger clamping system. It will prevent your neat clothes from falling and wrinkling. 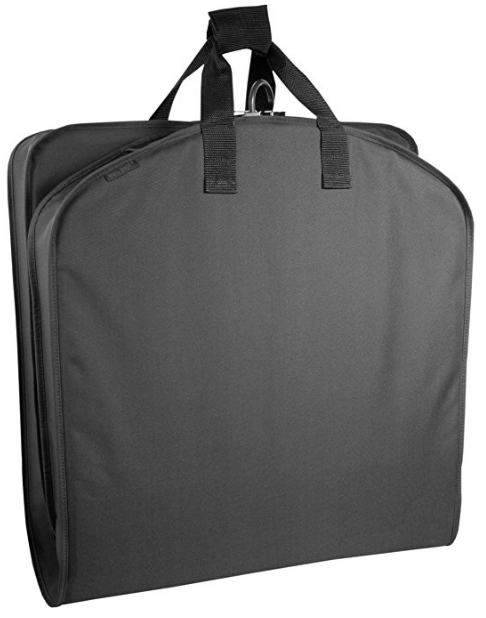 The WallyBags 40 Inch Garment Bag could accommodate several suits. Just put them on hangers and clasp. Close the zipper. And that’s all. From that moment on, there will be no reason to worry about your clothes. When you undo the clasp, take the suit out of this bag, and put it on, you will look impeccable. The bag is made of six hundred denier polyester. This material is much sturdier than three hundred denier polyester. Besides, this sturdy material is water repellant. It will protect your clothes from bad weather very well. The bag comes in black, purple, navy, blue and red colors. It looks rather pretty. The handles of this garment bag could be fastened together to provide you with an option of comfortable carrying. The bag is light when empty. And it remains light when it is full of your suits, dresses, and shirts. 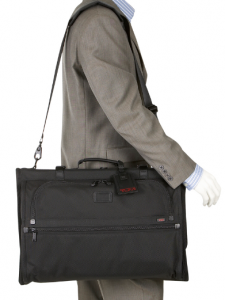 This bag is the best garment bag for suits. A duffel bag or garment bag? What to choose? If you ask yourself this question, this bag may become a perfect option for you. 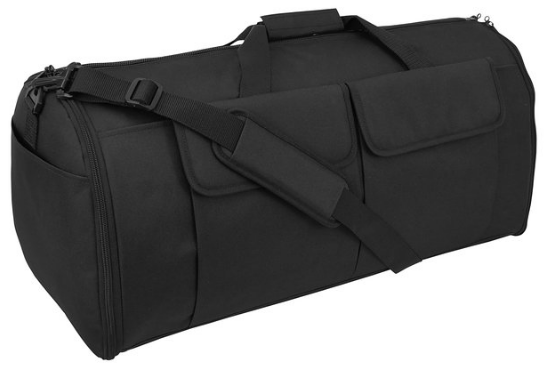 This duffle bag by Code Alpha converts to a garment bag thanks to its roll-up construction. By the way, Code Alpha develops bags for military forces and Navy SEALs. This company, as you have probably guessed, constructs bags from rather solid materials for use in the most extreme conditions. The bag could also be a go-to bag for traveling or a business trip. It is roomy, and it could keep a lot of your clothes and other essentials. The handles of the bag are well-sewn, and will not tear anytime soon. Moreover, this bag comes with an adjustable shoulder strap. However, it can be too exhausting to carry it for a long time. The main compartment is very large, it could hold your clothes neat and in perfect condition. The bag comes in several colors schemes, such as black, navy blue, air force digital camouflage and some others. It will not be too presumptuous to say that this hybrid bag is one of the best carry-on garment bags. 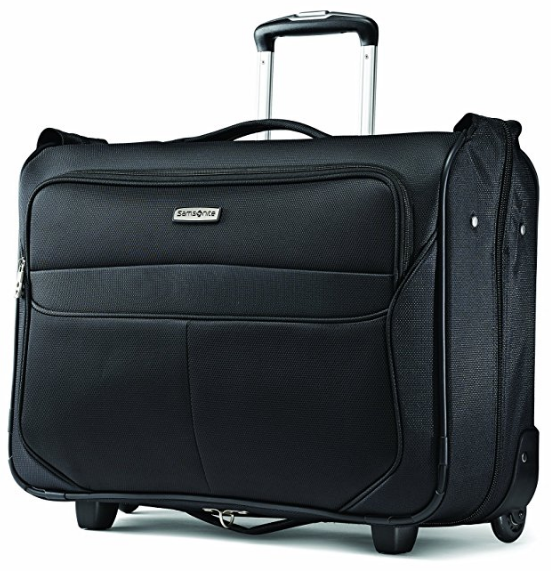 Travelpro is a manufacturer of high-quality luggage gear for those who travel by plane very often. This brand is well known all over the world not just thanks to its suitcases, totes, backpacks and computer briefs, it designs garment bags, too. This luggage garment bag is rather spacious, but not too bulky. It is very stylish, well-designed and will serve you for a long time. The bag is made of high-quality, rugged polyester fabric, which is water repellent. The lining is made of polyester, too. The bag comes with Travelpro’s stylish logo. The bag is very long when fully open, so you could store there maxi dresses and suits with ease. The garment bag is lightweight, and, at the same time, it could keep your clothes neat and wrinkle-free. After you put there a dozen of your clothes, there will still remain plenty of place for shoes, accessories, and personal care items. One more merit of this remarkable garment bag is its weight. It is light even when it is full of clothes. This bag is actually a perfect option for those who travel a lot so we can call it the best travel garment bag. Travelers’ Choice has been manufacturing high-quality travel bags for more than thirty years. The cases and travel bags of this brand are not only practical and durable but also modern, comfortable and well-constructed. The manufacturer keeps improving its products so every traveler could enjoy themselves while traveling without thinking about their luggage. Travelers’ Choice already thought about your things before you did. This garment bag is made of sturdy polyester. You can roll it on the wheels or carry the bag by its top carry handle. There is also an adjustable shoulder strap, which comes with this bag and allows you to carry the bag over the shoulder when necessary. This rolling garment bag is organized perfectly. The main compartment will have enough place for all of your clothes. There are some mesh pockets inside the bag for small essentials. There are numerous gusseted pockets on the bag’s outside. The fold-out construction aims to keep your clothes neat and to prevent wrinkles. The hook is quite heavy duty. 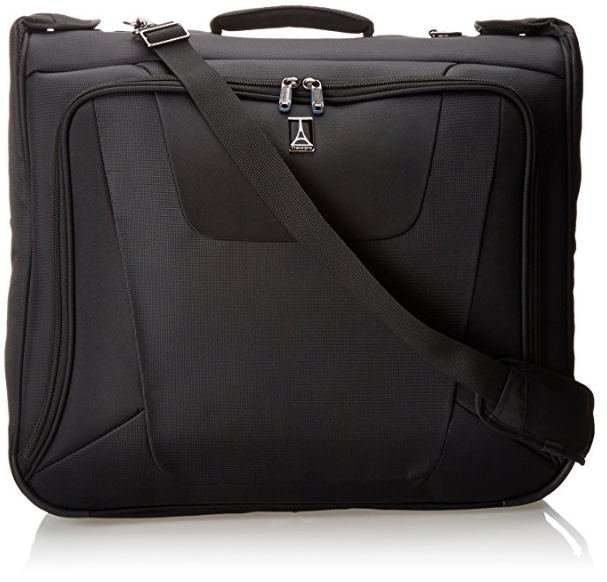 Consequently, this garment bag is a good option for business trips. This bag is a good option for a few days travel. Thanks to the innovative design, the bag is light and comfortable to carry. Besides, it looks elegant thanks to its black color. If you are going on a short vacation and intend to fill your bag with some of your staff, turn your attention to this bag. It is made of nylon. The handle is well-attached. The bag has a pull handle, which is made of an ultralight alloy. It allows you to roll your bag with comfort and to fit one more bag on the garment bag if you need. The main compartment is roomy. The hook is strong, you can put your clothes there with a hanger. After the flight just take them out and hang them. The clear pockets are good for best organization of your numerous small necessities, such as underwear, tights, and socks. The wheels are hard and roll smoothly. All the zippers are sturdy. The holes in the zippers are stylish and have the Samsonite logo. Use a secure padlock and keep your essentials securely. You will have to buy it separately. One of the best manufacturers of travel cases for expert travelers presents the Platinum Magna 2. What can be said about such a perfect rolling bag? A premium travel bag. Pure and simple. This deluxe garment bag is supposed to be at the top of the top. However, the product is not exactly affordable. And that’s the only reason it takes the third place. Nevertheless, this fact does not outweigh its advantages. By the way, the bag has a lot of them. The bag comes in stylish black and olive colors. The bottom of it is very strong thanks to the innovative construction. The telescopic handle is ergonomic. The zippers have leather accents. The handle is made of leather, too. The high-quality wheels roll straight and smooth. The case is stylish thanks to its brushed chrome accents on the handle. The bag is made of a durable material. There is Travelpro’s logo at the front and at the padlock holes of the zippers. I daresay this bag is the best wheeled garment bag, and I’m not exaggerating.